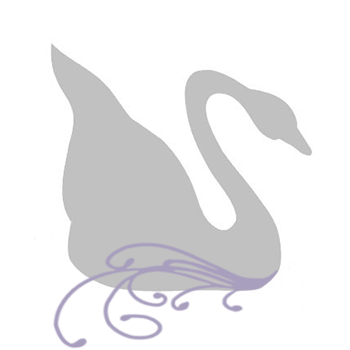 Today is a special day for couples all over the world, as many will wed today. So as the old saying goes, "Here comes the bride, all dressed in -Red?!" That's right, red. The red wedding dress is becoming increasingly common in North America. Although it may seem an absolute fashion rebellion, the choice to wear a red wedding dress varies for each bride who takes the plunge. For some brides, it is mostly cosmetic; they feel they look good in red and want to stand out in the warm, vibrant color that only red can deliver. Some brides will wear red for its' symbolic meaning of love and commitment, or of marriage and motherhood, or for religious beliefs. And still others choose the red wedding dress for traditional reasons relating to their cultural background. Whatever the reason, there are a variety of ways to incorporate red into your wedding day. As previously mentioned, you could choose to wear a red wedding gown or you could create a red and white theme for your wedding through favors, neckties, flowers, bridesmaids dresses or red accented beaded jewelry. The warm contrast between red and white is both sensual and feminine. 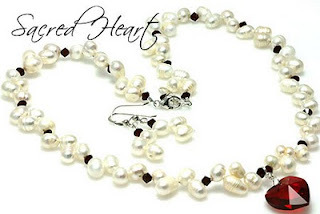 Whether you are getting married or simply want to get your sweetheart something beautiful, you won't want to miss the Sacred Heart Freshwater Pearl Crystal Heart Beaded Necklace Set. Embrace your unique side this beautiful beaded necklace and earrings set. Designed with a combination of feminine Freshwater Pearls and sensual red Swarovski Austrian Crystals, wire wrapped Crystal Heart Pendant (approx. 1/2" in size) finished with Sterling Silver components. This handcrafted beaded necklace set is new at CrystalAllure.com. The eclectic pearls and the red contrast on pale pearls are really lovely elements in this design. Will need to check into that.